Visit The Louvre, avoid the queues and enjoy your experience to the full as you enter this iconic building straight through the pyramid's main access. Just show your tickets on your smartphone and start your voyage of discovery inside one of the largest and most important museums in Europe. Explore the beauties inside one of the largest and most visited museums on an international level. The Louvre Museum will provide an opportunity to admire Leonardo da Vinci's La Gioconda (otherwise known as The Mona Lisa), the Venus de Milo, Canova's Psyche revived by Cupid's Kiss and a further 35,000 other works of art and artefacts which the museum is home to. 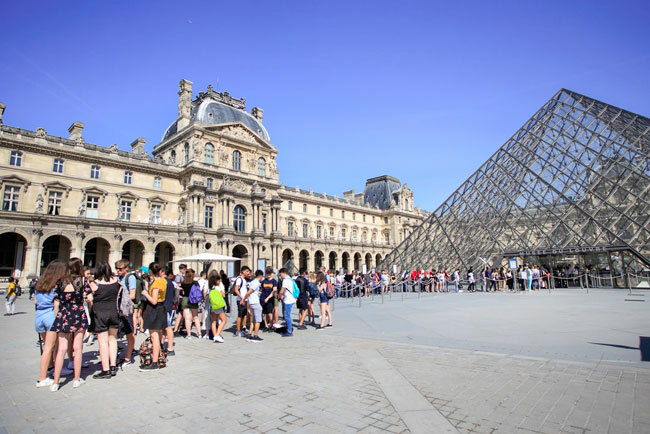 When you visit the Louvre, you are embarking on a truly authentic journey into history, crossing different eras and cultures in a vast space that houses more than 35,000 items. The collections are sub-divided into eight departments: Eastern antiquities, Egyptian antiquities, Greek, Etruscan and Roman antiquities. Islamic art, sculptures, art works, drawings and graphic art. In order to enable visitors to the museum to move around relatively easily, we receommend that you pick up one of the maps with a plan of the building (available at the information desks) to take with you as this will help you to get your bearings and make moving from one collection to another quite easy. In order to make the visit even more simple: each department is represented by a different colour and the rooms are numbered. Another useful piece of advice when it comes to finding your way around is to down-load the Museum App which costs just €5.00. The App will guide you around the interior of the building very easily which means you don't waste your time trying to work out where you want to go next. Insert the time at which you want to start your visit (spaced at 30 minute intervals) and click on the icon that says "Book Now." On the day of your visit, just show the entry tickets on your smartphone at the entrance to the pyramid of the Louvre. Are you looking for a quick tour just to see the most important works that are housed in the Museum of the Louvre? We have thought about that too - you can check this out by having a look at our article on the Louvre Museum. In the article specifically about the attractions, you will also find all our recommendations as to how to reach the Louvre by means of the public transport system in Paris.